Ronald J. “Kid” Mate, age 79, of Brownhelm Township, passed away peacefully on Friday August 24, 2018 with his devoted wife, Jacqueline, by his side. Ron was the son of the late George and Elenore (nee Derzola) Mate; born on November 7, (“Matemas Day”) 1938, he attended St. Stanislaus School. Ron was a graduate of Lorain High School as a member of the Class of 1956-B; he went on to proudly serve his country in the United States Army, and subsequently served the City of Lorain as an EMT and then Firefighter; he retired from his career in safety service in 1991. Ron was a twenty-five year board member of Northern Ohio Rural Water which he thoroughly enjoyed. He also cherished his membership in the Gourmet Club for over forty years; he was a long-time member of American Legion Post # 397 in Vermilion as well. As Christmas was his favorite time of the year, he brought smiles to all kids both young and old by seamlessly playing his role as Santa Claus with the Brownhelm Community Christmas Program for over a quarter century. Affectionately nicknamed Forrest Gump by his daughter and son-in-law, Ron just happened to be present during key historical moments for which he had many stories to tell. Throughout many life experiences, Ron remained humble and honest to a fault, finding the greatest pleasure in having friends and family that he loved over to share a meal in his home, or to fish or ice skate on his pond. He often entertained his guests with jokes, magic tricks, and his mastery of the Rubix Cube. Ron’s hobbies included skiing, traveling, listening to music, and attending both Vermilion’s Third Thursdays, as well as Mill Hollow Park’s Sunday Summer concerts. Additional interests included watching the sunset at Sherrod Park, and solving crossword and Sudoku puzzles. 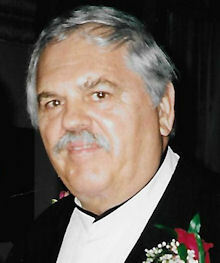 He was an avid fan of the Simpson’s cartoon show, an ardent fisherman, and an accomplished woodworker. He also enjoyed watching sports, especially Ohio State football. Ron had previously served as a Little League baseball coach, a referee for various games, and also played softball with the Firefighter’s. The originator of touch football in Lorain, Ron possessed a love for animals, especially humming birds and Baltimore Orioles which he fed every year. He is survived by his wife of forty-three years Jackie (nee Sugden), dearly loved son Lt. Colonel Aaron J. Mate (Major Nikki), USAF, and daughter Rachel E. (Todd) Liguzinski. He also leaves his treasured grandsons Evan and Alec, adored niece Christine (Jay) McKay, dear sister-in-law Harriet, and many wonderful cousins. In addition to his parents, Ron was preceded in death by his brother George. The Mate Family would like to extend their sincere and heartfelt gratitude to family members, neighbors, friends, the SPS Family, doctors, and nurses for all the help they provided during his care. Visitation will be Sunday September 9 from 1:00 p.m. until the time of a Celebration of Ron’s life at 4:00 p.m. in the Gluvna-Shimo-Hromada Funeral Chapel, 3224 Broadway Avenue, Lorain. Reverend Chuck Behrens will officiate. Military honors will be conducted by Amvets Post # 32 of Elyria. Burial will be private. In lieu of flowers, donations are kindly suggested toward the Brownhelm Community Christmas, C/O Sylvia Hugo, 8168 Vermilion, Road, Amherst, OH 44001.